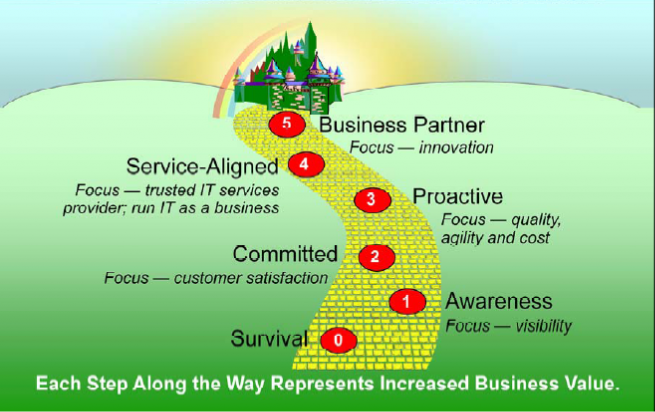 Aligning IT Operations with the Business is Not Easy! 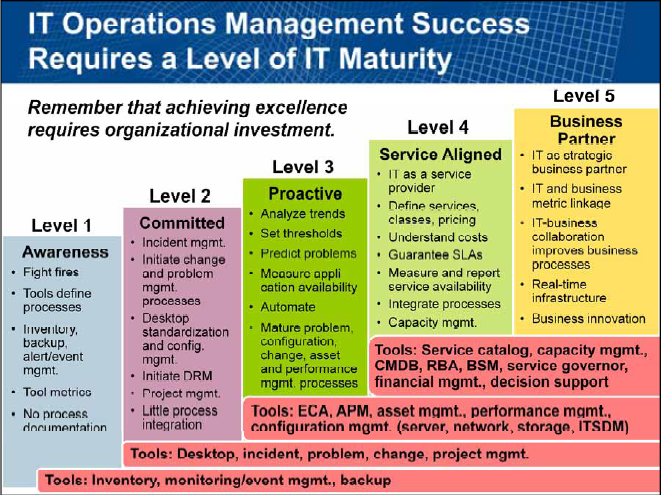 The importance of having your IT operations teams focused on the IT services and ultimately the demands of the business is highlighted by Gartner’s IT Operations Maturity Model below. A recent self-assessment by around 200 enterprises indicated that about 89% of organizations were at levels 1-3 (30% at level 1, 59% at level 2, and 11% at level 3). Almost none of these organizations felt they were sufficiently service or business aligned. What we proponents of IT service management do not fully comprehend is how difficult it is for IT operations staff to understand what a “service” is and how it impacts the “business”. Most administrators have a narrow focus – on the applications, servers, and networks that they are responsible for administering and operating. They rarely interact directly with business users and hence, the awareness of business issues remains minimal. The larger the organization, the more the silos, more the organizational hierarchy and the farther removed the IT staff are from understanding the IT service or the business. If you are struggling to make your IT operations team more business aligned, the Gartner self-assessment survey indicates that you are not alone! Learn more about Business and Enterprise Application Monitoring from eG Innovations. Find out how eG Enterprise delivered powerful business service management capabilities to a top IT professional services organization. Excellent analysis on the lines of maturity models. Its true that the business out come is more important than technology, but do we have enough business experts who will be able to translate the problem. Consider demand management, temporary resolutions, fixes are becoming a thing of the past. More than incident resolution, problem management are what customers are focussing on. The simple e.g., is resolve the problem rather than resolving or fixing an incident….